This week’s Object links to Bradford University’s work for peace and reconciliation and has become a global symbol of these ideas. 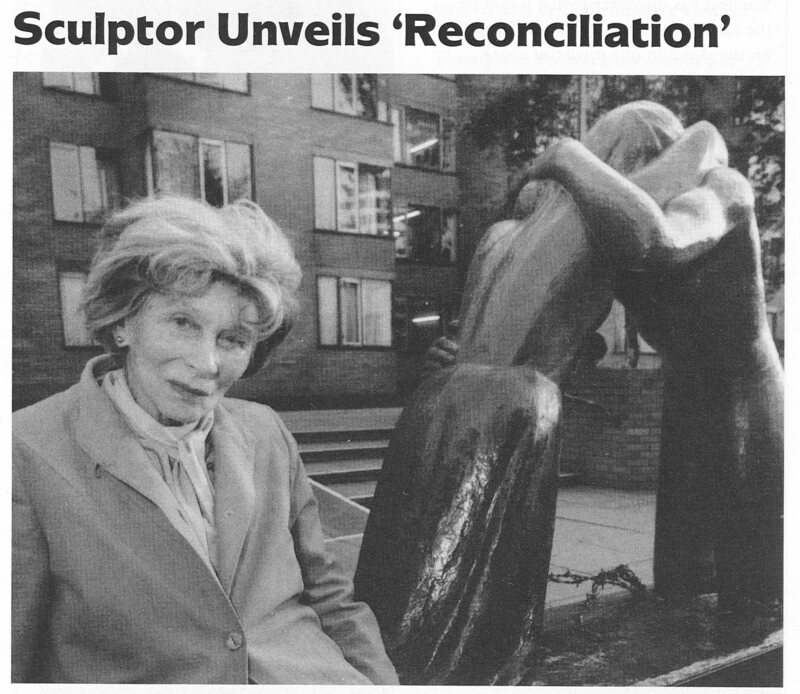 The sculpture Reconciliation is on permanent display in the square outside the J.B. Priestley Library, on the University’s city campus. It shows two exhausted figures, a male and a female, kneeling and embracing. Reconciliation sculpture with view of trees, J.B. Priestley Library, University of Bradford. Photo by John Brooker. Its creator, Josefina de Vasconcellos (1904-2005), was born to “an English Quaker mother and an atheist Brazilian diplomat father”: a figurative sculptor, her work was driven by her religious faith and concern for others. She married painter Delmar Banner in 1930; the couple made their home in the Lake District. Find out more about her fascinating life (she was also a “musician, composer, poet, dancer and inventor”) in two works quoted in this piece: the Guardian obituary by Linda Clifford and the biography Josefina de Vasconcellos: her life and art, by Margaret Lewis (Flambard, 2002). Twenty years later, like many other people who supported the idea, Josefina was inspired by the proposal to create a Chair of Peace Studies at Bradford University. She offered to create a larger version of her sculpture to be sited on the University’s campus. 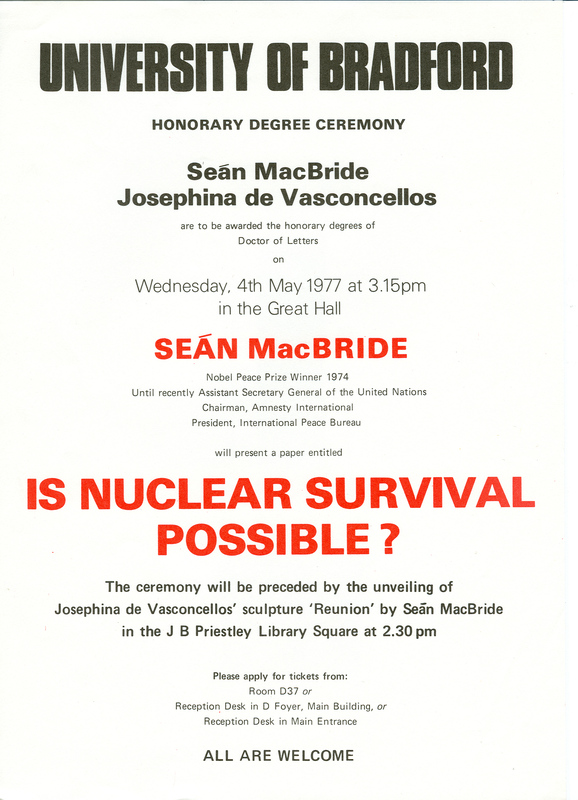 The result was unveiled by Nobel Peace laureate Sean MacBride on 4 May 1977. He and Josefina were awarded honorary degrees (DLitt) as part of the celebrations. Josefina’s links with Bradford University continued until her death: she donated paintings by Banner, created a wall piece, After the Storm, in memory of our first Vice-Chancellor Ted Edwards, and exhibited works by herself and her late husband at Bradford locations including the University in 1987. The image below shows her at a second unveiling in 1994 following repairs to the statue. The original name, Reunion, was changed to Reconciliation to emphasise the wider idea behind the design and to tie in with the work of Peace Studies. The design has become a worldwide symbol of reconciliation. Bronze casts of Reconciliation were unveiled in Coventry Cathedral and in Hiroshima Peace Park in 1995, fifty years after the dropping of atomic bombs on Japan; others were sited at the Chapel of Reconciliation at the former Berlin Wall and at Stormont in Belfast. This entry was posted in Peace, Quakers, University of Bradford and tagged Josefina de Vasconcellos, Peace, Reconciliation, Reunion, Sculptors, Sculpture, University of Bradford. Bookmark the permalink. 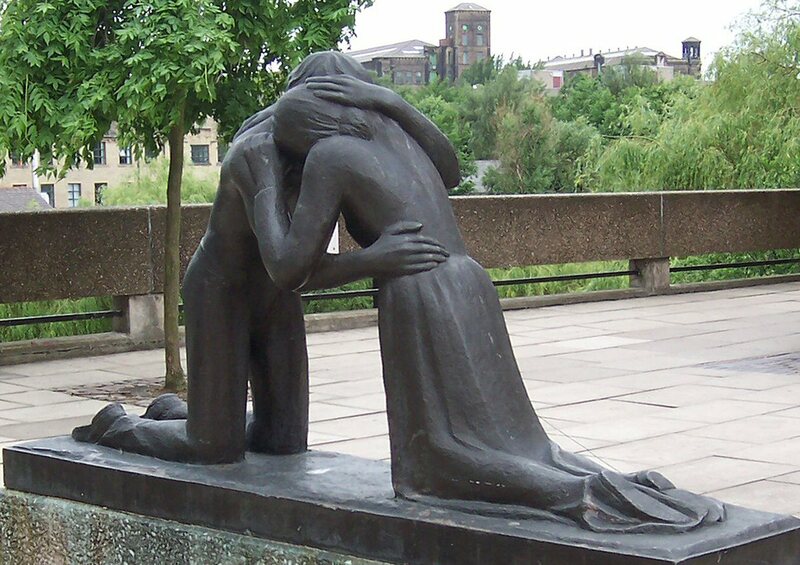 I would like to know, who is the owner of the rights of the sculpture “reconciliation”. In my oppinion it is “The University of Bradford”. Do you have an emailadress?